Black Stars coach Kwesi Appiah has named his starting line-up for Thursday’s international friendly match against Iceland at the Laugardalsvöllur in Reykjavik. 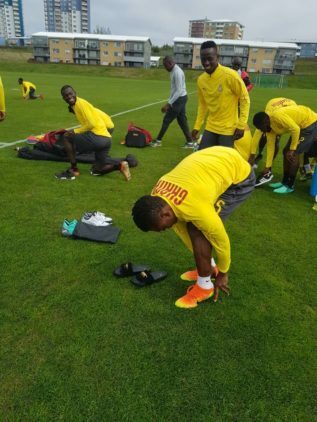 The game which will kick off at 8pm will be Ghana’s second friendly match in the summer break after beating Japan 2-0 last Thursday in Yokomaha. Lawrence Ati has been given the nod to start in post for the senior national team in today’s match against their World Cup-bound opponents. England based Andy Boakye Yiadom and Lumor Agbenyanu will start in right and left back positions respectively with Nicholas Opoku and Nuhu Kassim forming the central defence pair. In midfield, stand in captain Thomas Teye Partey who got the opener against Japan last week, will be partnered by Joseph Attamah while Nana Ampomah and Edwin Gyasi will be on the flanks in today's game. Last week’s second goal scorer, Emmanuel Boateng will once again be in action this evening alongside Raphael Dwamena. The Strákarnir okkar will also use the game as part of preparations for the the FIFA 2018 World Cup which will begin next weekend where they will face Nigeria, Argentina and Croatia.